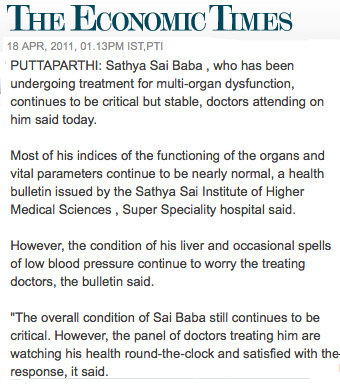 April 20th: LATEST of a series of increasingly worried – but more realistic – reports from the doctors makes it appear that the great myth about Sai Baba living into his 90s, as he has predicted – so his reason “I can finish My Task” is about to be blown apart. The end is almost certainly closer and closer. Repeated statements from Dr. Safaya and the Sathya Sai Central Trust – among others – are worded so as to reassure as far as possible the devotees of Sai Baba. The phrases “satisfied with the response”, “parameters continue to be nearly normal”, “his condition continues to be stable” (if critical) make it seem that this critical condition is only just a little away from normal. However, the fact is, Sathya Sai Baba is on a life support system. This almost certainly means that, were all the supportive medical interventions removed, his life would not be supported. In short, he is being kept alive by the use of drugs and emergency clinical techniques. This is not the miraculous sankalpa of “His Divine Will” (except in the minds of devotees which are beyond cognitive repair so far as to think he is taking on the sufferings of his devotees or even the entire world). 4) the liver (the very name of which indicates its vital importance to life), was and likely still is badly infected with jaundice and requires constant monitoring so it will not worsen. 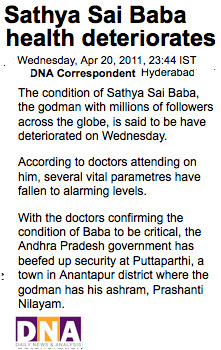 5) Last but far from least, the digestive system – unable to eat food, Sai Baba is on intravenous sustenance. The doctors do not spell things out like this, however, they are both devotees and therefore extra careful diplomats – not least considering the powerful emotions raging around the guru, the diverse accusations of misdeeds by SB’s minders and the litigation against those in charge of his assets and person.